This game starts out with the player having to choose which theme to enjoy; the jungle island or the big city chaos. In other words, you may choose to follow the explorers to the island ton capture the great King Kong or you can jump straight in the action when King Kong is on the loose in downtown New York. This slot machine from Playtech is an adaption of the blockbuster movie from 2005 directed by Peter Jackson and starring Jack Black, Adrien Brody and Naomi Watts. The slot machine is fantastic; great graphics, movie scenes and sound. King Kong surely delivers a great feel of the excitement from this old movie classic. You may bet on 20 lines over this 5 reeled slot machine from Playtech. The graphics and sound are exceptional in the King Kong slot machine. All the major characters from the 2005 movie have been nicely incorporated which gives the slot machine a very professional edge. The same goes with the sounds. The movie scores have been adapted to the slot and placed in very suitable scenes. King Kong himself is the Wild and it substitutes for all symbols except for the Scatter which is the logo Symbol: King Kong the 8th Wonder of the World. The lower paying symbols are 10, J, Q, K and A. As mentioned, you also have the face symbols of the movie characters like Ann Darrow, Carl Denham, Jack Driscoll and Captain Englehorn played by Naomi Watts, Jack Black, Adrien Brody and Thomas Kretschmann. There is no Gamble Feature in the King Kong slot machine. In the Jungle Island and the Big City mode, you can trigger a respin feature by hitting three or more Wild symbols on the reels. This will give you three respins. By hitting at least three scatters in the jungle mode, you will trigger the Skull Island Bonus where you have to match three creatures on a map of the Skull Island. Depending on if or which creatures you match – the cash will vary. 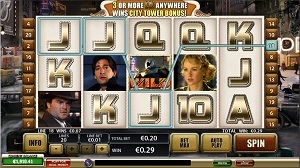 The King Kong slot machine from Playtech offers you to bet on 20 lines over 5 reels. The minimum bet per line is 0.01 currency credits and the maximum bet is 1.